DrinkAde Hangover Drink Review (Formerly "Never Too Hungover") - Does it help hangovers? When you say partying, we say booze. That’s been the the mantra for a lot of people ever since alcohol and late night celebrations got together hundreds of years ago, as far back as ancient Rome. So when you think about it, being hungover has been quite the problem for a long time and it’s only now that we’re learning how to prevent it or at least minimize the damage it brings. 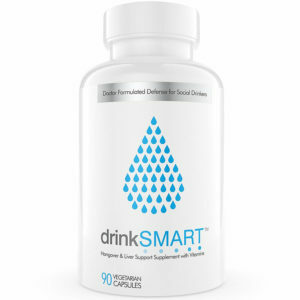 DrinkAde promotes itself as one of the solutions to our morning headaches and vomiting. We’ve seen a lot of hangover-supplements in the past, so we have to wonder if DrinkAde is the real thing. Read our review below to find out if DrinkAde is legit or nah. DrinkAde is formerly known as “Never Too Hungover.” We’re not exactly sure why they rebranded, but we can certainly guess why…It should probably be – Never LESS Hungover. 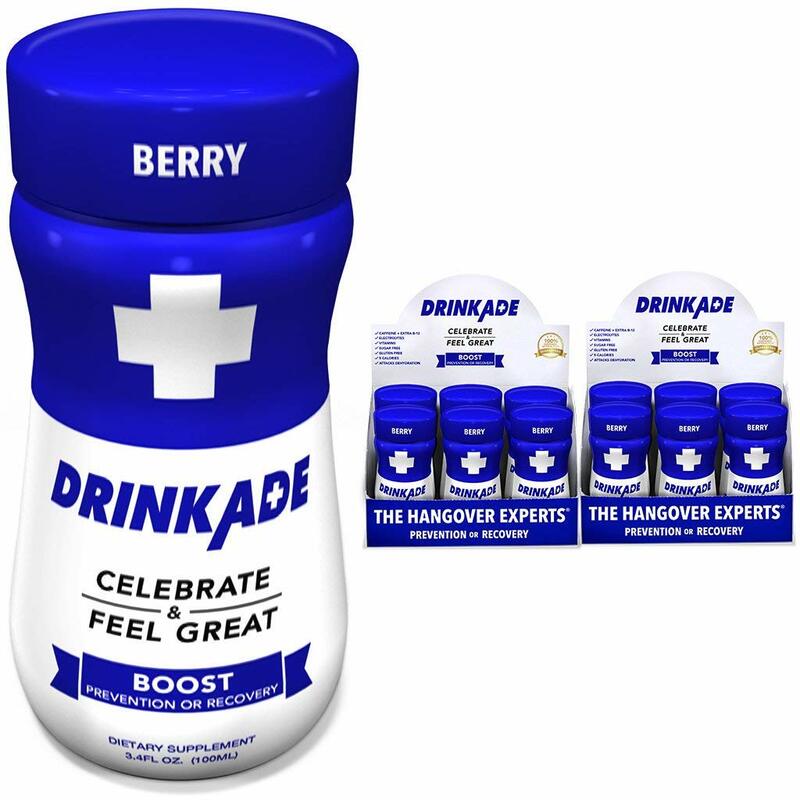 Like most anti-hangover drinks, DrinkAde works by combining a blend of herbs and vitamins that support rehydration and alcohol detoxification. All Natural. 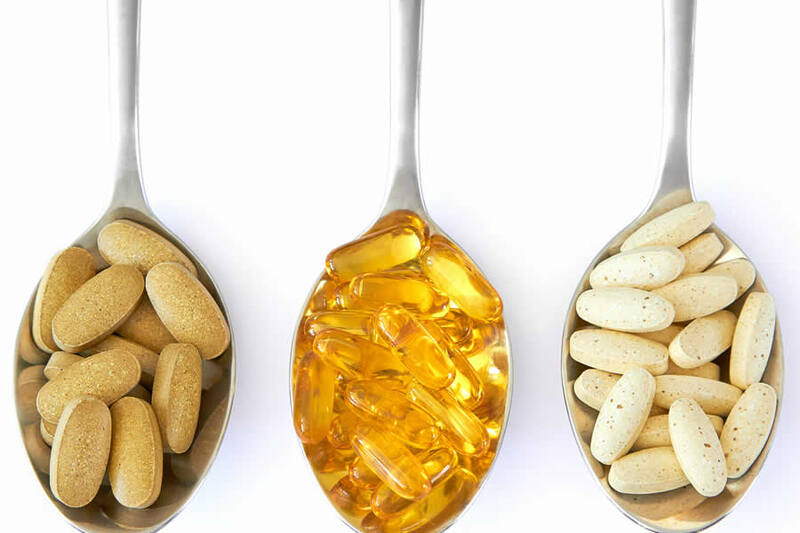 When it comes to supplements, people don’t like the idea of taking synthetics no matter how nature-derived they are. So with DrinkAde’s natural list, it only helps their marketing regardless of whether the naturals work better or not. Prop blend. Proprietary blends often serve to hide formulations from competitors. Too bad it also hides poor dosing from critics and customers alike. It has caffeine. We’re honestly not sure why caffeine is included. Not to mention the dose is really high. What could be their angle here? Vitamins and Minerals. 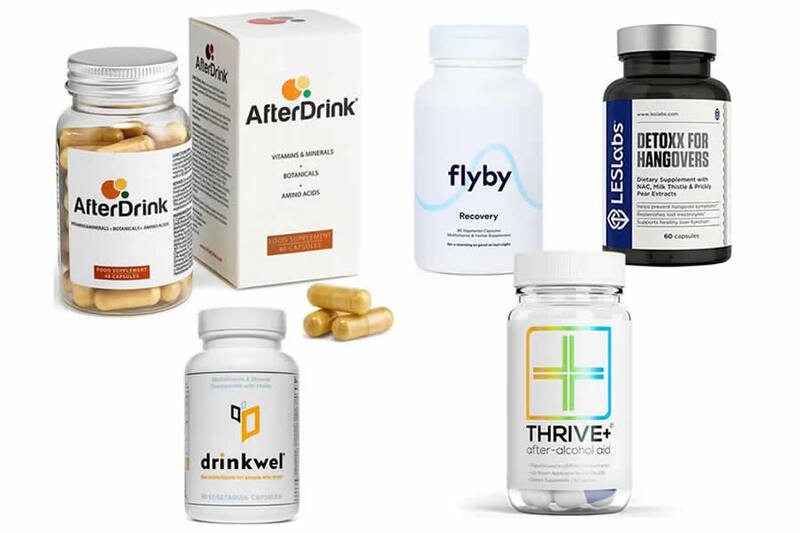 As expected from a hangover drink, we have good amounts of vitamins and minerals all aimed to replenish lost stores as well as improve the body’s rehydration efforts. The only thing we don’t like is they used the cheap forms for B12 and B6. When it comes to nutrient absorption, the form of the nutrient matters as it determines the bioavailability. For B6, you want P-5-P and Methylcobalamin for B12. Aloe Vera. 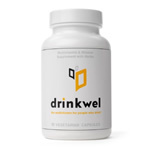 DrinkAde says this helps the livers detoxifying power. While there are studies that show this, we’re more concerned about the possibility of aloe vera supplementation causing liver damage and even inducing hepatitis as some studies suggest. N-Acetyl Cysteine. NAC’s main benefit is improving glutathione stores. Why is this important? Glutathione is our body’s primary antioxidant and helps protect our liver. 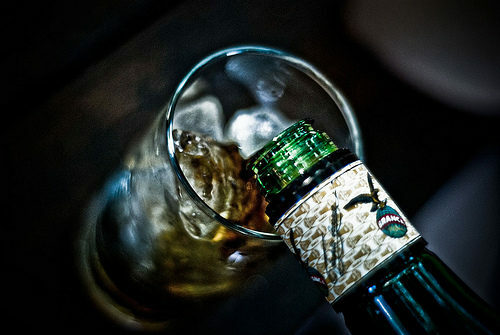 Alcohol-induced liver damage is no joke, so it’s good to have NAC in any hangover cure drink. Milk Thistle. The active ingredient is silymarin. 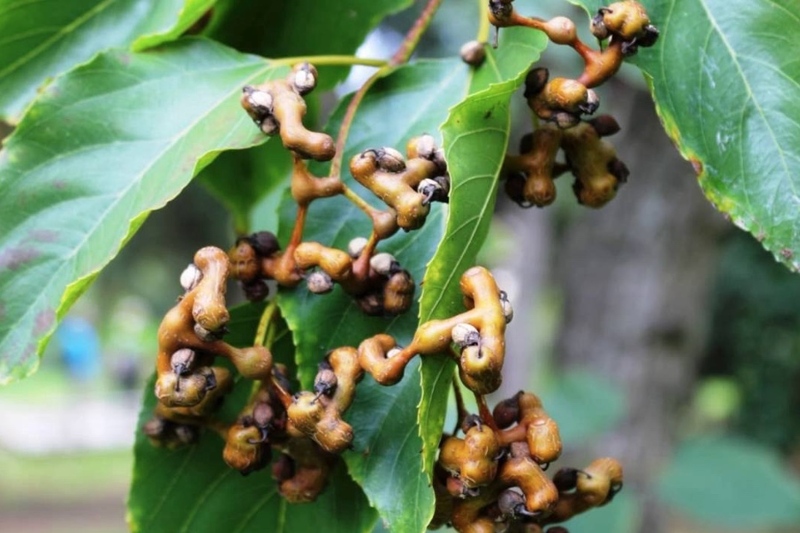 It offers liver protective properties and is widely used in a lot of liver supplements. The problem is, it’s not standardized in DrinkAde and therefore includes the possibility that it may not have enough silymarin to do its job. Glutamine. Glutamine has been shown to exhibit liver-protective properties and one study even cites its liver-regenerating property. The study made use of lab rats, one control and the other taking glutamine supplements. The conclusion was diet supplementation with L glutamine is beneficial for liver regeneration. The problem we see in glutamine supplements is the amount needed for it to have an effect in humans, with some supplements recommending close to five grams or at least one gram. The serving size is simply too small to accommodate even half that. Green Tea. Green tea extract is a well known ingredient capable of a multitude of health benefits, mostly for fat oxidation and heart health. The reason for DrinkAde including Green Tea is for its toxin neutralizing properties. Green tea has many antioxidants, among them EGCG which is the main driver of its many benefits. However, we don’t see how much EGCG we’re getting and it’s a problem since some green tea extracts may not even have EGCG at all. Eleuthero root. Also known as Siberian Ginseng, Eleuthero is praised for its energy benefits, mainly for physical and sexual performance. It also helps manage certain diseases and abnormal conditions as well as some light claims on liver health. The problem we see here is the dose is definitely too small. We know how ingredient labels work and the first ingredients are dosed the heaviest and the last ones end up making do with what’s left. Rhodiola rosea. Rhodiola Rosea is a well-known adaptogen – an herb with antistress properties. We see why DrinkAde used Rhodiola Rosea as it’s been shown to reduce symptoms of depression, anxiety, and generally calms the mind. 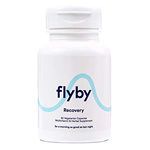 It definitely could help with hangovers, but again the problem is weak dosing. Gotu Kola. This is definitely the weirdest addition to any hangover cure drink we’ve seen. Gotu Kola is supposed to be a milder alternative to caffeine as it promotes a slow-acting energy distribution which is supposed to prevent the crash most caffeine lovers experience. It’s all well and good, but this is an anti-hangover drink. There have been some research done on the “helpful” effects of caffeine on hangovers, but the cons outweigh the pros. The deeper we go, the more inclined we are to think DrinkAde doesn’t work as advertised. 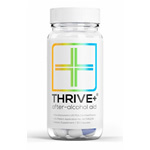 It has the basic nutrients for hangover prevention and liver protection in the form of vitamins, minerals, and some herbals like milk thistle and NAC, but that’s where the good stuff ends. Aloe vera could be a problem as it’s been shown to cause liver damage in some (albeit rare) cases. Its also pretty highly dosed. 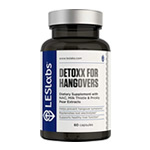 Then we have glutamine which, while could help with the liver, is not only underdosed, but barely offers much research when it comes to actual hangovers. We appreciate the liver-health angle DrinkAde took, but we’re looking for a anti-hangover drink first, liver protective second. 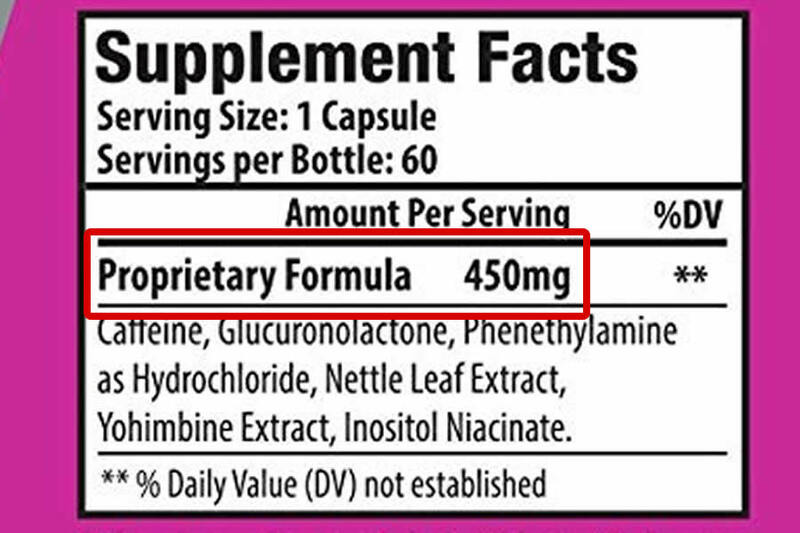 Then we also have the addition of 189 mg of caffeine in one serving. 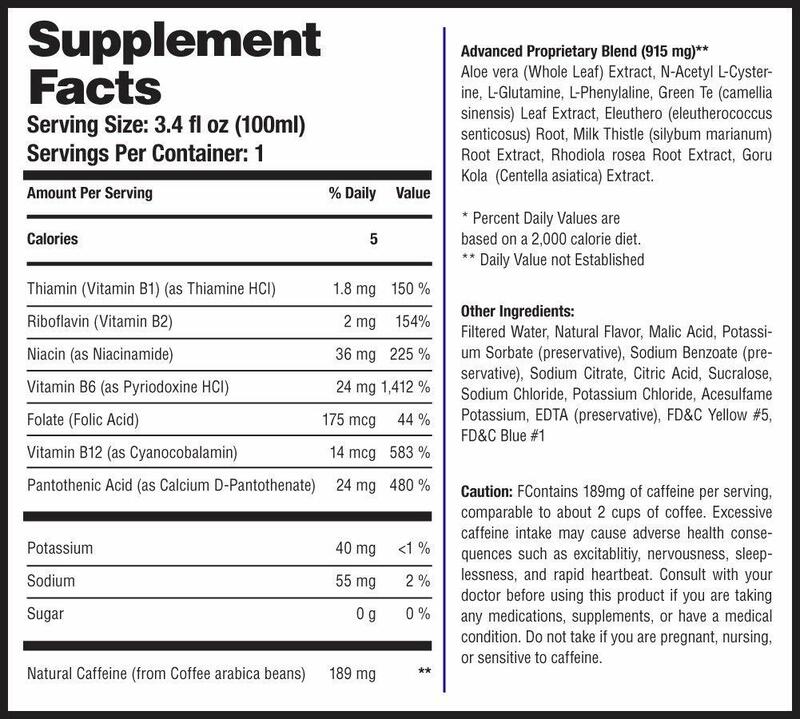 One cup of brewed coffee contains 80-90 mg of caffeine, so with DrinkAde you’re getting more than two cups in one bottle! Why is a hangover drink promoting energy in the form of caffeine-spikes? Even if DrinkAde is a “drink before alcohol” supplement, we drink beer to feel relaxed and “happy” and not to ponder why it feels like our heart could burst out of our chest at any moment! 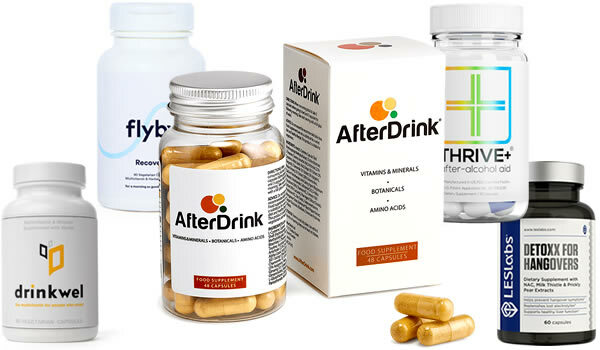 At best, DrinkAde can help you recover a bit faster provided the vitamins and minerals work. You’ll also get high energy, but whether this is a benefit or not is debatable. 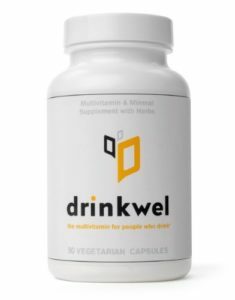 Truth is, DrinkAde could potentially hurt you more than help you, what with the addition of herbals that either don’t need to be there or can induce liver damage. As for the caffeine, you might get sweaty, jittery, or even crash when the spike’s gone. 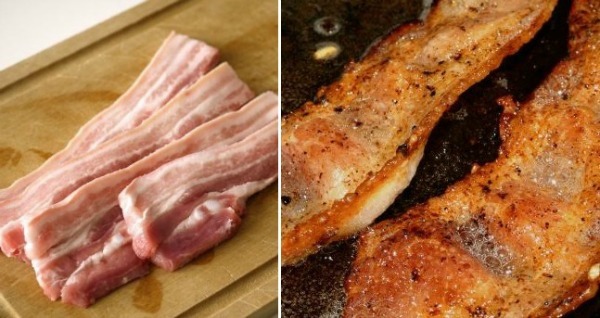 These are side effects you can’t have in a hangover cure drink. There are positive reviews, but we’re skeptical about them. Energy boost: It will at least give you enough energy to power through the long night. Antioxidant potential: The herbals do help in other ways. Liver protective: Even if it doesn’t help with hangovers, at least your liver’s gonna be okay…we hope. Aloe Vera: The fact that it can damage the liver is already a bad mark for us. Low dosing: Prop blends do a good job at hiding doses, and we’re sure it’s because they’re too low. 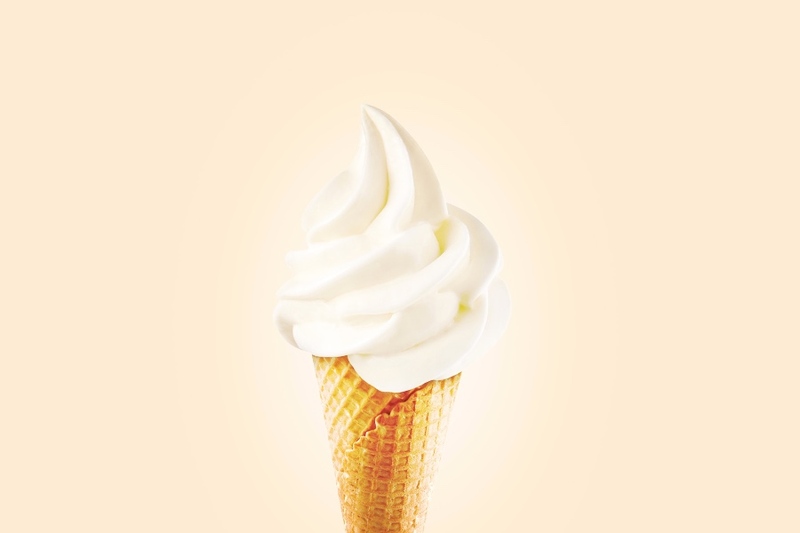 Low-quality ingredients: They made use of powders and herbs, but none of them are concentrated. As much as DrinkAde showed promise at the start of this review, our review and research proved otherwise. From prop blends to questionable ingredient additions, DrinkAde just isn’t one of the better hangover cure drinks. At best, it could help with your liver but that’s about it.